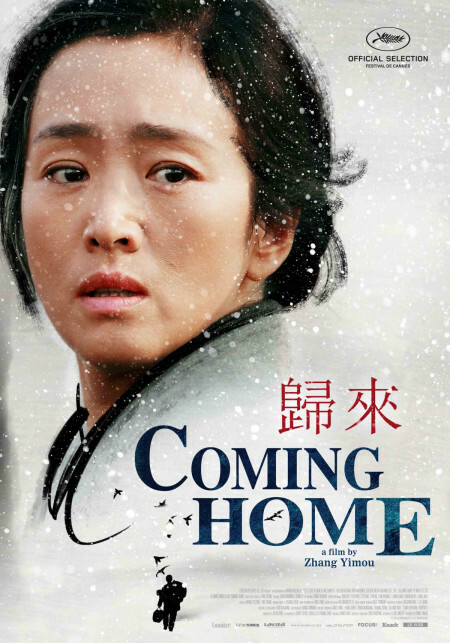 The theme of the modern historical drama COMING HOME is clearly close to director Zhang Yimou's heart. The influential Chinese director, whose father and brother were accused of being spies during the Chinese Cultural Revolution, was pulled out of school in the 1960s and sent to a labor camp. From there, he transferred to a textile factory and reportedly sold his blood to buy his first camera. A frequent target of Chinese government censorship, Zhang has offered veiled political critiques in allegorical films like JU DOU, released after Tianamen Square, and RAISE THE RED LANTERN, both of which concerned women married into abusive patriarchal situations. He's been known to be stylistically unpredictable – those familiar with aerobatic martial-arts epics like HOUSE OF FLYING DAGGERS would scarcely recognize the Zhang of this film, based on a portion of a novel by Lu Yanshi. Yu, who deeply misses her husband, is conflicted. She decides to meet Lu at the train station, where a melee — dramatically shot and edited – results in his being recaptured. Yu emerges from the tumult with a bleeding gash on her forehead. Years later, the Cultural Revolution now ended, Lu is released — he's been deemed “rehabilitated.” Dandan has given up dance and, as Zhang did, now works at a textile factory. Her mother, however, is suffering from serious memory loss. Though it's conceivable that this was the result of her injury at the train station, doctors have diagnosed it as “psychogenic amnesia,” for which treatment is unavailable in China. She lives alone amid notes affixed to the walls (“Turn Out the Light”) as aids against forgetting. When Lu returns to her, she looks right through him — and at times reacts violently, confusing her long-unseen husband with Fang, a Party official who abused her. Dandan, whose feelings about her father are complicated by resentment and guilt, cannot bridge the gap of recognition between her parents. Gong Li's acting is a marvel. She imparts Yu's flickering emotions through exquisitely calibrated expressions and is deeply affecting as the older Yu navigating her way through bittersweet confusion. Chen Daoming is also quietly moving as the man patiently tending to his uncomprehending wife. Reminiscent of stories about the effects of Alzheimer's, the film is about a devoted couple finding their way back to each other. Lu devises strategies he hopes will spark his wife's memory. He plays on the piano the songs he played long ago. He reads her letters he wrote to her over the years but was unable to mail. She comes to know him only as “The Letter-Reading Comrade.” One can easily imagine this poignant tale as the basis of an opera. The film, contemplatively paced and only a trifle longer than ideal, is enhanced by Xuaidubg Zhao's lovely cinematography and subtle, sentimental piano music performed by Lang Lang. (In Mandarin with English subtitles). 4 out of 4 stars.